The EDGE Curriculum book is 232 pages, featuring 9 full chapters that cover everything from the Basics of the Game, Driving, Approach, and Putting Lesson Plans, Elementary, Middle, and High School Fitness Plans, plus Classroom Linked Lessons. The book contains a host of extras like games and puzzles, and valuable resources to offer you a complete program that can be used over and over again. 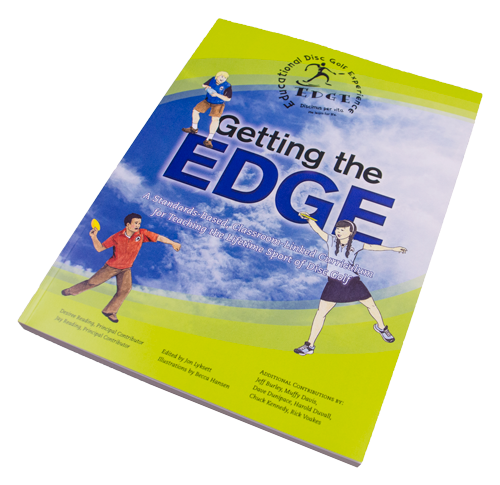 The lesson plans from the EDGE curriculum cover a broad range of topics within both disc golf and academics. To give you a better feel for our curriculum, we have provided two sample lesson plans below. Our Classroom Linked Lesson Plan teaches a math lesson by looking at disc golf course lengths; and the Disc Golf Lesson Plan depicts a fun disc golf game with emphasis on learned disc golf skills. We have also provided a sample illustration that depicts a backhand throw.